Wet & Wild provides it’s clients with World Class Alaska King Salmon Fishing. 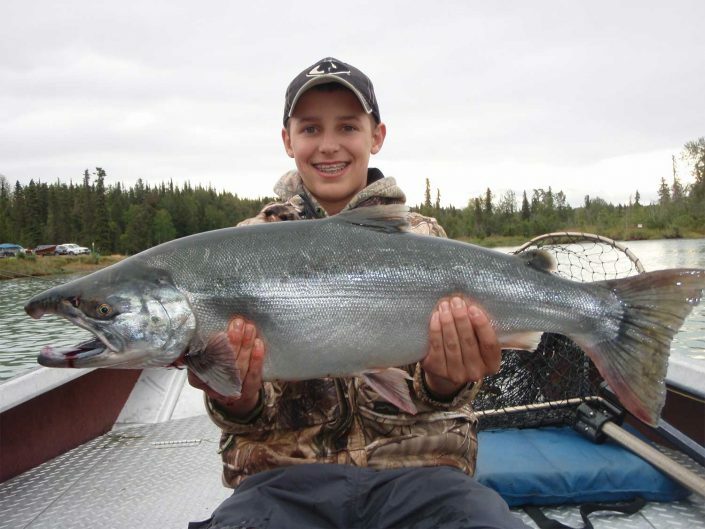 Jeff Moore, your expert Kenai ..
Silver Salmon or Coho Salmon are the most aggressive and acrobatic fish for their size. They can and will put ..
Rainbow Trout fishing is one of the most thrilling fishing experiences an angler.. 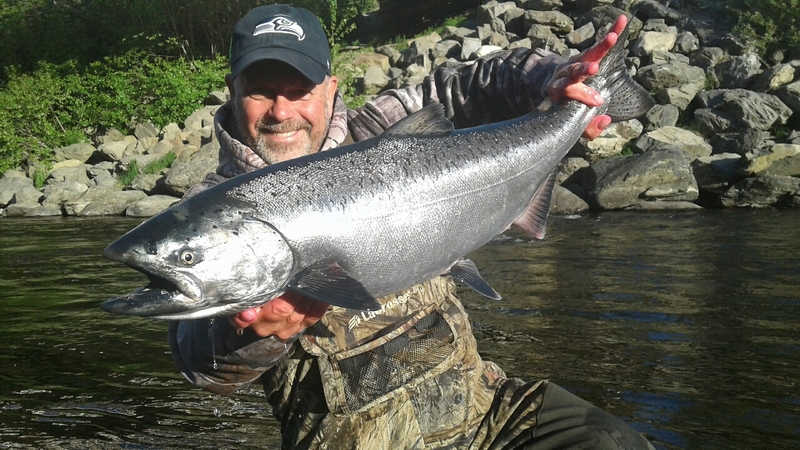 Mid May thru mid August..
One day, that elusive 100 pound king salmon is going to be caught. After all, this is the world famous Kenai River, the place where the largest king salmon are spawned, and where angling legends are born overnight. 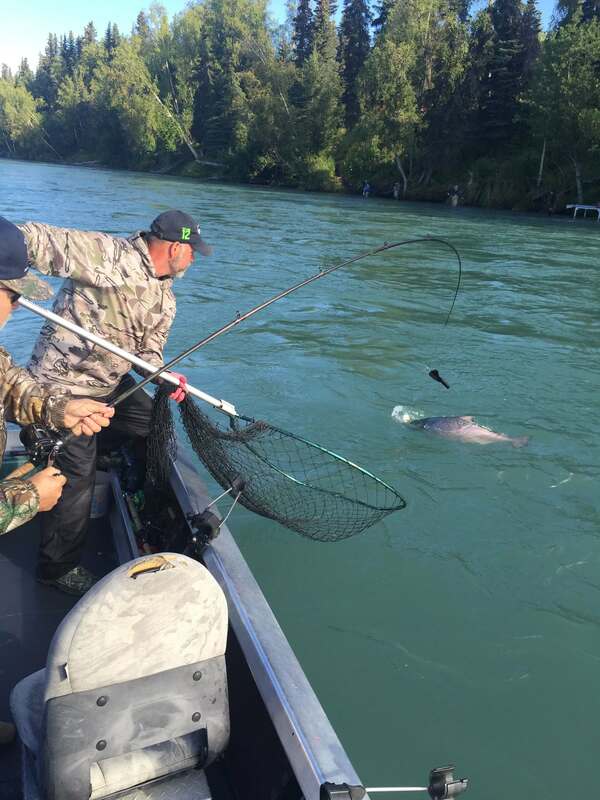 What makes Alaska salmon fishing in the Kenai River so special is that every cast represents a chance to catch the new world record king salmon. 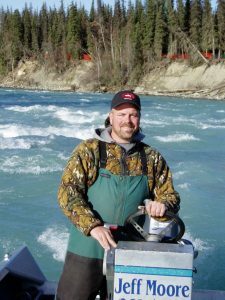 With over 30 years fishing the Kenai River, Alaska fishing guide Jeff Moore knows the spots where the big fish like to hang out, and he is ready to share this knowledge with all of his guests. Jeff has fished thousands of successful and happy anglers. See the testimonial page for actual accolades about Jeff and his abilities to make your high expectations a reality. May 17, 1985 was a warm spring day on the Kenai River. Les Anderson was just another Alaska fisherman trying his luck, like so many had done before. By day’s end, Anderson would make history by landing 97 pound 4 ounce king salmon, a world record that still sits atop the record books today. Eight of the top ten kings have been caught in the Kenai, proving that there is no body of water for Alaska salmon fishing that can compare. Jeff has come very close to beating this world record. He has bagged four fish weighing in at the upper 80 pound mark on certified scales with 89 pound 3 ounces being the largest caught in 1989. Every year, Alaska fishing guide Jeff Moore leads his clients to some of the largest king salmon and trophy rainbow trout caught on the Kenai. 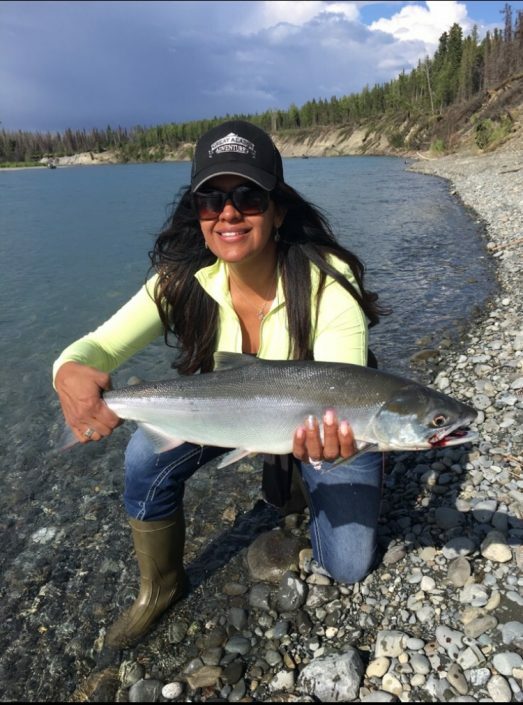 Take some time to browse our photo gallery and see for yourself that there is no substitute for experience when it comes to fishing for the many trophys that the Kenai River has to offer. Knowing any body of water is essential for angling success, and this is especially true on the Kenai. 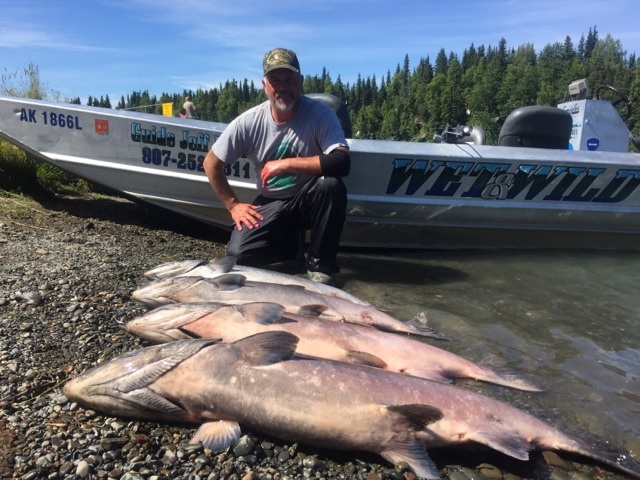 The next Alaska salmon fishing legend could be you, and Captain Jeff Moore has the knowledge and skills to turn your fishing trip into the adventure of a lifetime. Whether the fish are biting or not we guarantee that you will have a fun and memorable Alaskan Fishing Adventure. At Wet & Wild Alaska Fishing, we want your trip to be more than just a day on the water. For many of our clients, coming to Alaska is a lifetime dream, and we want your fishing experience to surpass your expectations. While the primary focus is always Alaska salmon fishing, we are eager to make every aspect of your vacation unforgettable. Whether you are a first time novice or an experienced angler, Jeff takes pride in making your fishing experience one of a lifetime! First and foremost, we are proud, year-round resident Alaskans with a love for this wild land. 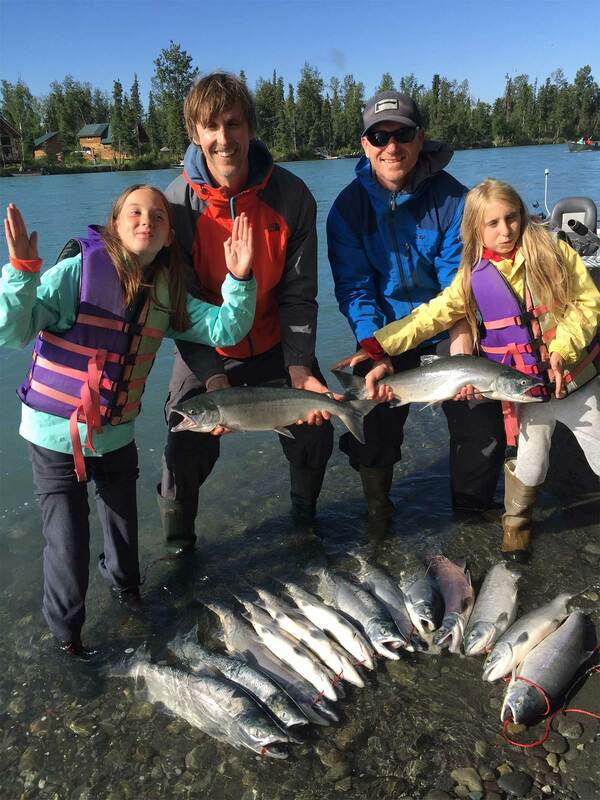 Alaska fishing guide Jeff Moore raised his family in this great state, and takes immense pride in sharing his love for Alaska with all of his guests. 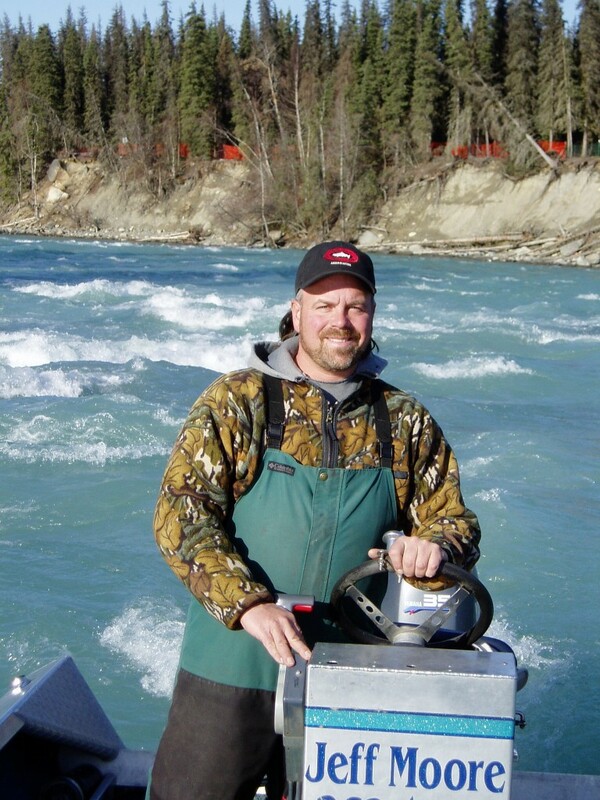 Captain Jeff is a Master Guide with the Kenai River Professional Guide Association. Community involvement is at the core of his guiding philosophy, and Wet & Wild is operated annually with this commitment in mind. To make your stay as enjoyable as it can be we offer knowledgable information about all of your Alaskan Fishing Vacation needs. We can direct you to the best lodging options and other add on options to make this a vacation of a lifetime. We live here and know the best and most reputable options available. We are here to assist you. Please do not hesitate to ask for our assistance. Depending on the size of your group and their needs, your Alaska salmon fishing trip can be customized by reviewing many of the options available. Lodging options are varied from the budget minded cabin to the lodge where price is not an option. We can recommend many add on options from Deep Sea Fishing, Scenic Fjord Trips to Adventurous Flyout fishing and bear viewing excursions. We also don’t cut corners when it comes to our gear. Alaska fishing guide Jeff Moore uses only top-quality equipment, because gear should never be the reason why a big fish gets off the hook. Captain Jeff runs a 20’ Wooldridge vessel powered by a 50HP Yamaha four-stroke engine. Shimano reels, lamiglas fishing rods, Power Pro braided fishing line, Gamakatsu hooks and skillfully cured fishing bait round out our high-quality gear. We believe that when you’re fishing for the biggest fish, there is no substitute for the best fishing equipment money can buy. When you’re done with your day, all of your fish can be processed at your request. This includes cleaning, filleting and bagging in preparation for the processor of your choice. You can also choose to have your fresh Alaska fish flash frozen and packed into wax boxes for easy transport back to your home. Be warned; when your friends see your pictures, they are going to want a taste of some of your Alaskan bounty. We are confident that we can make your Alaska salmon fishing trip one of the best of your entire life. By offering a wide range of services, we believe that we are at the forefront of quality fishing on the Kenai River. Whether the fish are biting or not we guarantee that you will have a fun and memorable Alaskan Fishing Adventure. I have known and fished with Jeff Moore on annual fishing trips for the last 11 years. I’ve learned to respect not only his fishing knowledge, but his true value as a wonderful person. He always tries his hardest to make your Kenai fishing trip a memorable experience.Jeff is simply the best guide I have ever known; and I have fished for over 50 years from Alaska to the Amazon. I came to Alaska on vacation in 1991 and fished with Jeff for a week. My dad, brothers and I caught huge Kings and huge rainbows! Then I moved here in 2007. I fish with Jeff at least a dozen times a season. The fishing and his professionalism are always top notch. I am sure I am in some pics on his website since I have caught a 17 pound silver, 55 and 45 pound Kings, a 20 pound steelhead and a huge 32″ long,18 inch girth, 14 pound rainbow trout! I’ve known Jeff for over 20 years and would not fish the Kenai River with any other guide. Jeff and I were like bothers when I lived in Alaska for 10 years and we fished together during the summer months almost every weekend I could make it down from Anchorage were I was living. I could tell so many stories of the great fishing we had done over those years from Sockeye Salmon, King Salmon, Silver Salmon and Halibut fishing with even clamming on the Kenai Pennisala. As a Alaska Resident I have high standards for any Fishing Guide I would use. Jeff Moore fills all expectations I have for quality of service, effort applied and Quantity and Quality of fish. My Wife and myself have used Jeff for our guide on the Kenai for 12 years now. We have fished Kings and Reds with him. Always an outstanding day on the River. Highly recommend his service. You will not be disappointed. I have fished with Jeff Moore for the past 12 years and have found him to be “consistently excellent” and “attentive” to landing the fish. He is an extremely hard worker, knowledgeable in every aspect of fishing, and never tires in working to make your trip enjoyable and memorable. 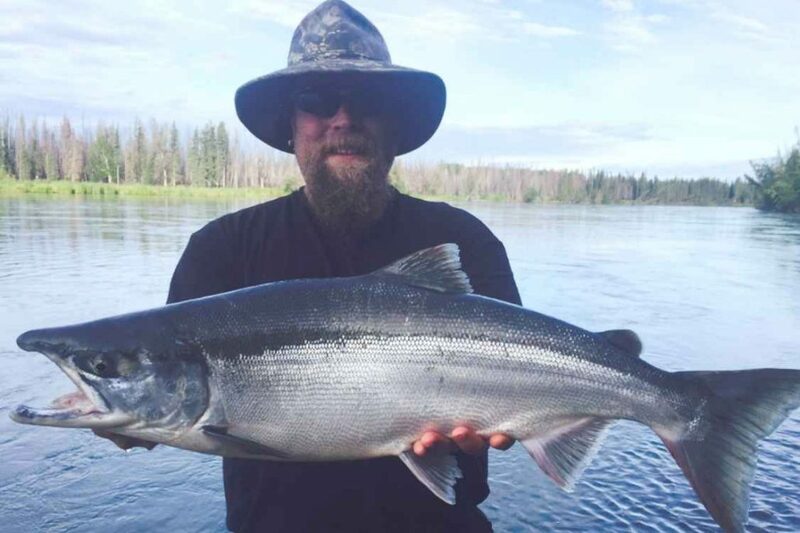 His intimate knowledge of the Kenai River will assure that you have the best chance of catching your salmon and/or rainbow trout of a lifetime.. I have had the pleasure of fishing the Kenai several times with Jeff, and each was a great experience with top-notch equipment ,fish and a knowledgeable , polite guide. I have no problem recommending Jeff ‘s services for a pleasurable day on the Kenai. Depending on the time of year, your fishing adventure can be customized to target a wide variety of species from Monster Kings to World Class Rainbow Trout. This include fishing for sockeye, silver and pink salmon. Many of our clients are eager to tangle with the largest game fish in Alaska – halibut. We provide opportunities to go fishing for multiple saltwater bottom fish including halibut, rockfish, and lingcod. All of these fish are considered prime fare for the dinner table, and halibut fishing is yet another chance for guests to bring home what Alaska has to offer. The Kenai River in Alaska also holds some of the fattest and thickest lunker rainbow trout in the world. Much like the king salmon, a trophy rainbow is always just a cast away, and Alaska fishing guide Jeff Moore knows the cuts and bends where the biggest bows like to hang out. Dolly Varden and Arctic Char are also readily available on the river, and round out what can only be described as one of America’s best fishing destinations. For the Best Seats of the Season!! The Kenai River is where fishing legends are born. Every cast provides anglers with a chance to break a world record, catch a trophy king salmon, or achieve their own personal fishing achievement. Best of all, the Kenai area is a jumping off point for some of Alaska’s most thrilling outdoor adventures, and Wet & Wild is ready to make it happen. 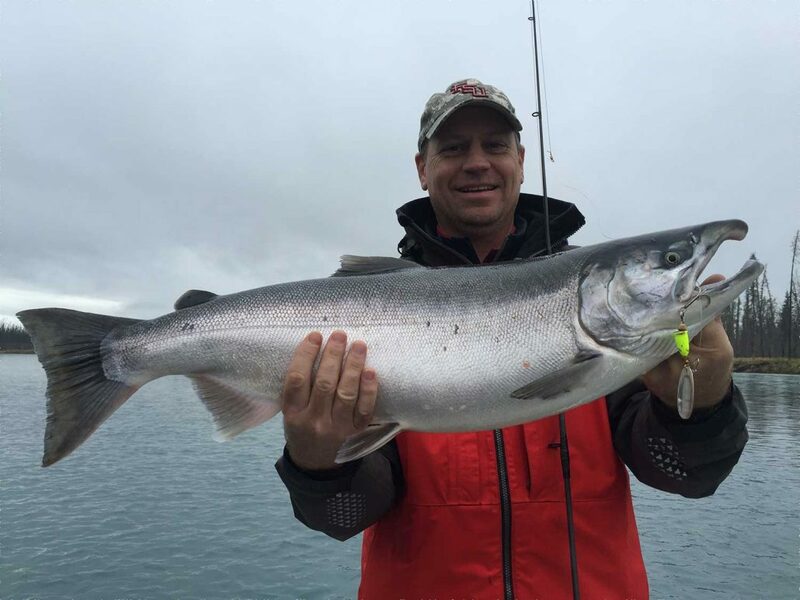 Alaska salmon fishing guide Captain Jeff Moore has more than 31 years of experience fishing the Kenai River, which means he knows how to maximize your opportunity to catch the big ones. During his time on the water, Captain Jeff has helped clients catch countless trophy kings, massive rainbow trout, and a number of other noteworthy species. If you’re ready to put your angling skills to the ultimate test, book a trip with Alaska salmon fishing guide Jeff Moore and find out why the Kenai earned its reputation as the best place in the world to catch massive king salmon. Wet & Wild Alaska Fishing can also arrange your lodging and a number of other activities for clients who book a charter. The Kenai River is synonymous with world class fishing for good reason. Eight of the top ten largest king salmon were caught on the Kenai, including the current number-one record fish. Wild trophy rainbow trout are also commonly caught on the Kenai, making these charters something truly unique in the fishing community. Captain Jeff is dedicated to helping his clients get the most from their Alaska fishing adventure. As a proud, year-round Kenai local, you can have confidence in the ability of your captain, and take pride in the fact that your tourist dollar is staying in the state. When it comes to fishing anywhere, you already know that it’s impossible to beat local knowledge, so give Wet & Wild a call to set up your next Alaska fishing adventure. Captain Jeff does one thing better than anyone – catch large fish on the Kenai River. But at Wet & Wild, we can also arrange other aspects of your trip to help you get the most out of your Alaska adventure. We proudly work with other local Alaskan companies that make it possible for your family and friends to experience the Alaska of their dreams while you concentrate on that trophy king. If you have any special needs or requests, don’t hesitate to contact our office and ask. The Kenai area offers access to some of Alaska’s most pristine, unspoiled wilderness, making it possible to do just about anything you desire while visiting. 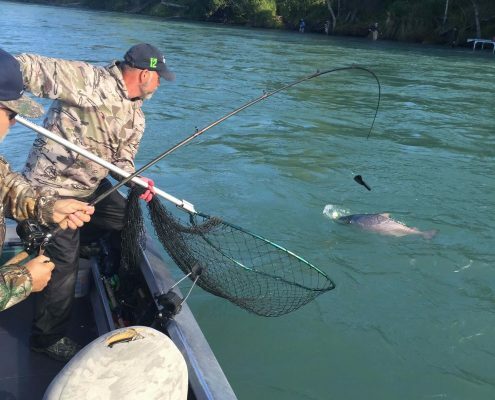 When targeting massive trophy salmon, you have to pay close attention to your gear and tackle. Captain Jeff never cuts corners when it comes to his gear and everything is meticulously cared for to ensure its reliability when it’s put to the ultimate test. First and foremost, Captain Jeff operates a 20′ Woolridge fishing vessel powered by a 50hp Yamaha four-stroke engine. This comfortable boat has all the power needed to get you into the best spots on the Kenai in as little time as possible. This means more time fishing and less time fooling around. You’ll be using the best Shimano reels affixed to top-quality Lamiglass rods and outfitted with Power Pro braided line that won’t stretch when a big king runs perpendicular to the boat. We cure our own fishing bait and attach it to the sharpest Gamakatsu hooks, so you never have to worry about losing a trophy king because of neglected or outdated tackle. If you want to keep your fish to enjoy at home, we clean, filet, and bag your catch at no additional charge. We will then send it to the processor of your choice to have it smoked or flash frozen. We recommend keeping your catch a secret from your friends back home or they will likely demand that you share. 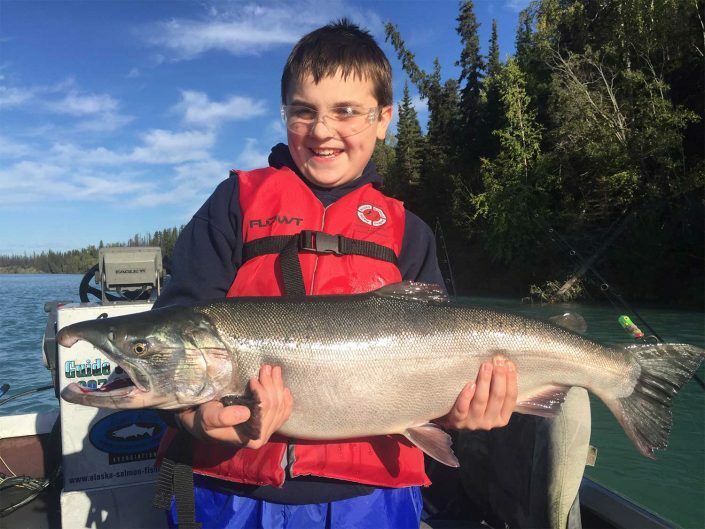 While king salmon are the big show on the Kenai River, there are a lot of other fishing opportunities for serious anglers and novices to the sport. What follows is a brief breakdown of each species you can target with your Alaska salmon fishing guide at various times throughout the season. King Salmon are the undisputed heavyweight champions of Alaska sport fish. No other salmon achieves the massive size of the king, and the Kenai boasts the largest kings in the world. King salmon typically spend four years at sea before returning to their native river to spawn. What makes the Kenai River unique is that king salmon spend five years in the saltwater before returning to spawn. That extra year allows them to achieve massive sizes not found in any other river system across the planet. Captain Jeff can target king salmon any day throughout the season. During his 31 years on the river, he’s seen some huge fish landed by clients including a monster that weighed in just a few ounces shy of 90 pounds. Someday the king salmon world record will be broken, and that historic fish will be caught on the Kenai. Will you be the fisherman who catches it? Rainbow Trout are the second-most targeted fish on the Kenai because they are wild fish that grow to incredible sizes. Some of the fattest and thickest rainbows in the world are caught every year on the Kenai, and trophy fish are common throughout the season. Keep in mind that rainbow trout are not like the little guys you catch in your favorite stocked pond back home. These fish are fast, mean, and offer the ultimate test to any trout angler or fly fisherman. If you’re looking to test your angling skills, this may be the most challenging fight against a trout that you will ever endure. Silver Salmon may not be the biggest of the salmon species, but they more than make up for it with their fighting spirit and high numbers. If you enjoy fast action, your Alaska salmon fishing guide can keep cohos flying in the boat at breakneck speed when the run is in full swing. Many clients enjoy combining their silver fishing with king salmon fishing to get the best of both worlds. Slivers make for great table fare, and if you’re fishing with a group you can easily fill a freezer when the bite is on. You’ll be amazed at how tenacious coho salmon can be, as they will often make long runs and leap high out of the water. Sockeye Salmon are seldom thought of as sport fish because they’re not typically caught with conventional gear. However, with the right setup your Alaska salmon fishing guide can target sockeye if you enjoy what is considered to be the best eating fish in the world. Pink Salmon may not be in the same caliber as other salmon species, but they offer some exciting action when they are running up the Kenai. If you’re new to the fishing game, pink salmon offer a great opportunity to hone your skills before rigging up for the big boys. Dolly Varden are little known outside of Alaska, and when anglers first hear the name they often look puzzled and say, “Dolly Parton?” No… this char has nothing to do with the famous country singer, but it is a hard fighting fish for its size. Arctic Char look a lot like Dolly Varden, but they grow to much larger sizes and are considered fine table fare. It’s not uncommon to see arctic char on the menu at local Kenai restaurants. Halibut, Rockfish, and Lingcod are all delicious white-flesh fish that can be caught offshore in the Kenai area. While Captain Jeff focuses his energy on the Kenai River, we are more than happy to arrange a saltwater charter for any and all of these fish at your request. Spend a day or two on the river and then head out into the salty brine for a chance to catch you own “barn door” trophy halibut with a local charter captain who also calls Kenai home. When you fish with Alaska salmon fishing Captain Jeff Moore, you can customize your trip to target multiple species in one trip. When you set up your charter, be sure to tell us what you hope to catch and we can recommend the best time of year to accomplish your angling goals. Kenai and surrounding area is a popular destination for travelers of all sorts. 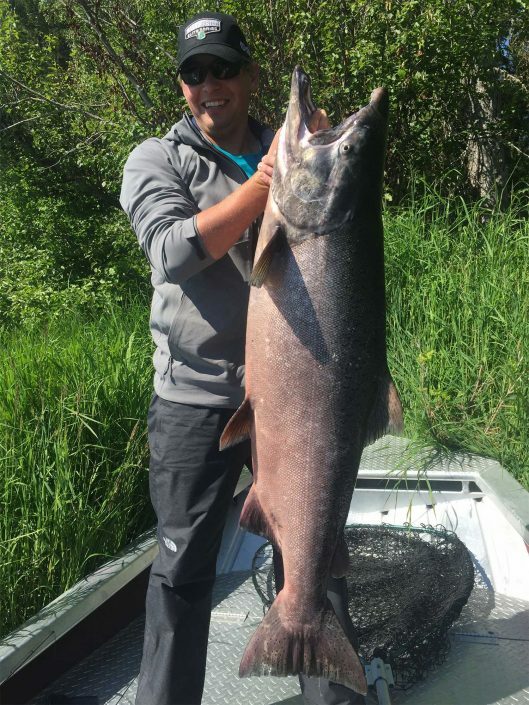 If you want to catch trophy fish on the Kenai with the best Alaska salmon fishing captain in the area, we recommend booking your trip as soon as possible. We are dedicated to helping you get the most out of your Alaska vacation, so if there is anything we can do to help just let us know. Captain Jeff understands one simple fact: It’s all about the fish. Any serious angler knows that fishing is an art, and when you hire a guide you expect a virtuoso. Captain Jeff will use his extensive knowledge and unrivaled experience to put you in the best position to land the fish you’ve always dreamed of catching. Contact Wet & Wild to customize your fishing adventure today. We operate from June 1st though the middle of October, and we highly recommend booking far in advance. 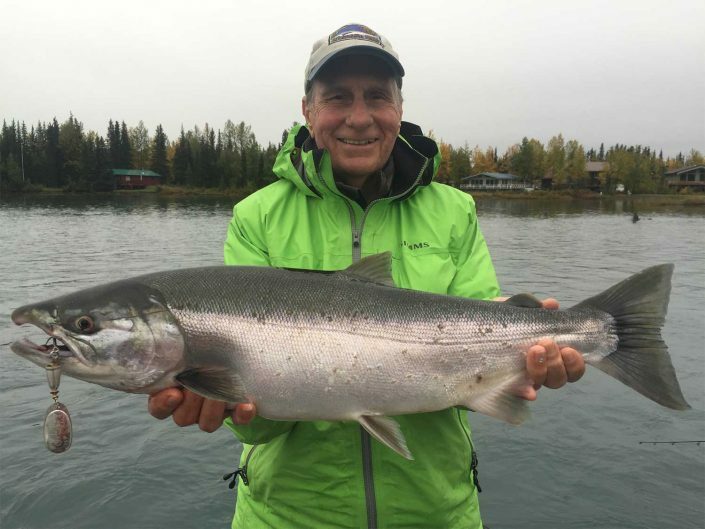 The next world record king salmon is always just a cast away, so try your luck on the famous Kenai River with a captain who knows how to catch fish. We use only USCG licensed and fully insured Fishing Guides for our clients. All Fishing Guides must be certified in CPR and carry USCG safety equipment on board.